Enum concept introduced in 1.5 versions. When compared with old languages enum java's enum is more powerful. By using enum we can define our own data types which are also come enumerated data types. Internally enum's are implemented by using class concept. Every enum constant is a reference variable to that enum type object. Every enum constant is implicitly public static final always. Every enum constant internally static hence we can access by using "enum name". Internally inside every enum toString() method is implemented to return name of the constant. Until 1.4 versions the allowed argument types for the switch statement are byte, short, char int. But from 1.5 version onwards in addition to this the corresponding wrapper classes and enum type also allowed. That is from 1.5 version onwards we can use enum type as argument to switch statement. If we are passing enum type as argument to switch statement then every case label should be a valid enum constant otherwise we will get compile time error. We can declare enum either outside the class or within the class but not inside a method. Every enum in java is the direct child class of java.lang.Enum class hence it is not possible to extends any other enum. Every enum is implicitly final hence we can't create child enum. 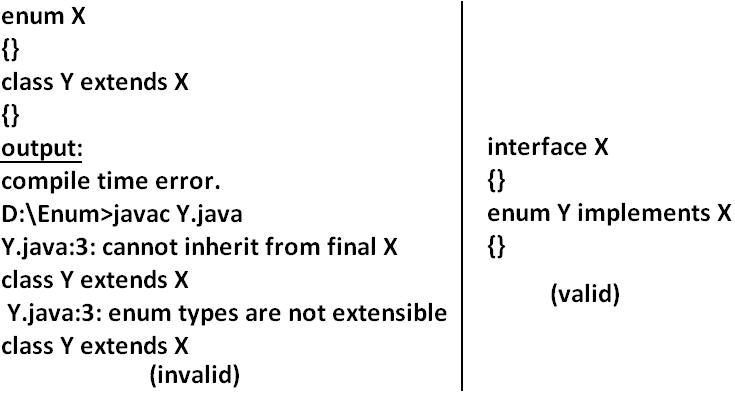 Because of above reasons we can conclude inheritance concept is not applicable for enum's explicitly. Hence we can't apply extends keyword for enum's . But enum can implement any no. Of interfaces simultaneously. Every enum in java is the direct child class of java.lang.Enum class. Hence this class acts as base class for all java enums. It is abstract class and it is direct child class of "Object class"
It implements Serializable and Comparable. Every enum implicitly contains a static values() method to list all constants of enum. Within enum the order of constants is important we can specify by its ordinal value. We can find ordinal value(index value) of enum constant by using ordinal() method. for(Beer b1:b)//this is forEach loop. When compared with old languages enum, java's enum is more powerful because in addition to constants we can take normal variables, constructors, methods etc which may not possible in old languages. Inside enum we can declare main method and even we can invoke enum directly from the command prompt. In addition to constants if we are taking any extra members like methods then the list of constants should be in the 1st line and should ends with semicolon. If we are taking any extra member then enum should contain at least one constant. Any way an empty enum is always valid. Enum can contain constructor. Every enum constant represents an object of that enum class which is static hence all enum constants will be created at the time of class loading automatically and hence constructor will be executed at the time of enum class loading for every enum constants. If we comment line 1 then the output is Hello. We can't create enum object explicitly and hence we can't invoke constructor directly. Inside enum we can take both instance and static methods but it is not possible to take abstract methods. Every enum constant represents an object hence whatever the methods we can apply on the normal objects we can apply the same methods on enum constants also. Which of the following expressions are valid ? If we want to use classname directly from outside package we should write normal import , If we want to access static method or static variable without classname directly then static import is required. enum : enum is a keyword which can be used to define a group of named constants. It is a class present in java.lang package . Every enum in java is the direct child class of this class. Hence this Enum class acts as base class for all java enum's . It is a interface present in java.util package . We can use Enumeration to get the objects one by one from the Collections.